The legacy of a young woman whose sudden death shook the farming communities is to live on with the implementation of life-saving equipment in rural Norfolk. Reymerston farmer Lucie Proctor was just 26 when she suffered a cardiac arrest during a work Christmas party in 2008 and - despite frantic efforts to save her life - she died five days later in hospital. Her death was attributed to sudden adult death syndrome. 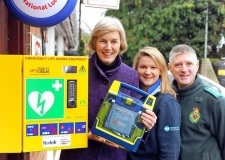 Determined to do something positive to remeber Lucie, her family and friends raised £20,000 so automated external defibrillators (AEDs) could be set up at 13 sites around the county. The first of these life-saving machines was unveiled in Filby yesterday and her family hope they will help prevent further tragedies. Annette Alston, Lucie's mother, said: "I lost my daughter three years ago and just wanted to do something pro-active." "She had a cardiac arrest and it just came out of the blue." "We wnted to do something positive so we started fundraising that would have helped her." AEDs are portable electronic devices that automatically diagnose cardiac incidents and apply electrical therapy to allow the heart to reestablish an effective rhythym. Lucie had been married for only 18 months to farmer Rob Proctor and worked as membership services manager for Anglia Farmers. She was a past chairman of Dereham Young Farmers and Mr Proctor was Norfolk Young Farmers Club county chairman for 2007/8, so her family approached Norfolk farming clubs for help in where to site the life-saving machines. Jessica Shiach, 21, from Acle Young Farmers Club, said: "After Lucie's story we know how important this is and if these machines had been in a place when she had her cardiac arrest there's a possibility she could still be here." The Acle club chose a site by Filby Post Office for the first AED. A further 12 are set to be stationed at Dereham, Diss, Downham Market, Harleston, Loddon, North Elmham, Bacton, Walcott, Reepham, Terrington, Wymondham and Watton and Attleborough. They require no training so anyone can use them and they can help save lives in up to half of cardiac arrests. Andrew Barlow, community partnership manager for the ambulance service, said that having AEDs in the rural community will help cardiac arrest sufferers get treatment more quickly. And if CPR is administered within five minutes of the cardiac arrest, the survival rate is 50pc higher. Installation of the AEDs and training in how to administer CPR is being supported by the East of England Ambulance Service.